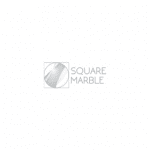 Square Marble Technology (SMT) is an innovative financial technology company with 25 years’ experience in building fintech software. With its mission to ‘square the circle’ by pursuing perfection in every aspect of their customers’ financial management, the company is breaking new ground by using business intelligence as the foundation of its application development in ‘order to cash’ software. In 2014 the SMT team challenged themselves to create an intelligent business application for order to cash management, re-engineering their existing successful second generation application, ‘Ero 57’. The envisioned third generation SaaS platform was “Intelligent Account Management,” or Mia®. Mia would use data analytics to support innovative business process transformation in order to drive growth. It would provide transparency across legacy processes, transforming the way that C-Suite leaders can capture and interpret data. Equipped with rigorous intelligence, the platform would optimise key operational areas to turn traditional risk into opportunity with data-driven clarity. SMT’s extensive planning for Mia recognised the need to outsource custom development expertise. Ballard Chalmers has a solid reputation in the sector, for example having engineered and delivered the first entirely web-based fintech system in the Private Equity Fund Administration field (see here). With the strong track record and experience that would be needed, SMT enlisted Ballard Chalmers for the fully bespoke build of this enterprise financial operations system. Working together with SMT, Ballard Chalmers delivered the bespoke SaaS Mia platform with state of the art security and back-up. Risk Management: Mia integrates with credit agency data and combines this with her internal score cards to produce dynamic trade limit and risk decisions that are relevant to your business. Group Relationships: Flexible relationship tables enable users create customer groups to manage exposure, credit limits and tasks at a parent level. Multiple parent levels can be created so that users can manage group relationships in any way that is required. On-Boarding: Mia integrates with ID&V and credit rating agencies to deliver an on-boarding decision in under 5 minutes which can be pushed to ERP using our API’s so that customers can start trading immediately. Credit Limit Management: Manually over-ride Credit Limits with limits of authority approval permissions so that you can set temporary and Trade limits above the score card credit limits when increased business opportunities arise. Customer Trading Status Management: Manage the customer trading status using dynamic decisions based upon overdue invoices, legal events and TED v credit limit. Workflow Management: Set the parameters and Mia will assign users automated tasks for completion whilst giving them access to the data and documents that they need to secure payment quickly and easily. Dispute Management: Set the rules and Mia will automatically assign disputes so that users can quickly and easily move the dispute to resolved for credit or collection. The Mia daisy chain process will open a new task when a previous task has been completed such as dispute closed raise credit will automatically raise a task for the billing team to raise a credit note. Task Management: Use task management to assign tasks to appear in colleagues activity lists for completion. Task completion is analysed for user performance statistics. API’s: Give users access to critical information in real time as changes are made in source systems. Push the data via API calls to Mia services so that she is always up to date. Mia can also push changes back to your ERP and CRM in real time. Self Service Imports GUI: Import your data seamlessly into Mia using the import GUI. Easily map csv, xml data file into Mia and manage any failures by exception using the GUI interface. The listening service will pick up and process files whenever they are placed into the sFTP and report back the import file success and the reasons for any failure so that you may easily reload. Self Service Exports GUI: Export data seamlessly out of Mia using the export GUI and push to your sFTP. 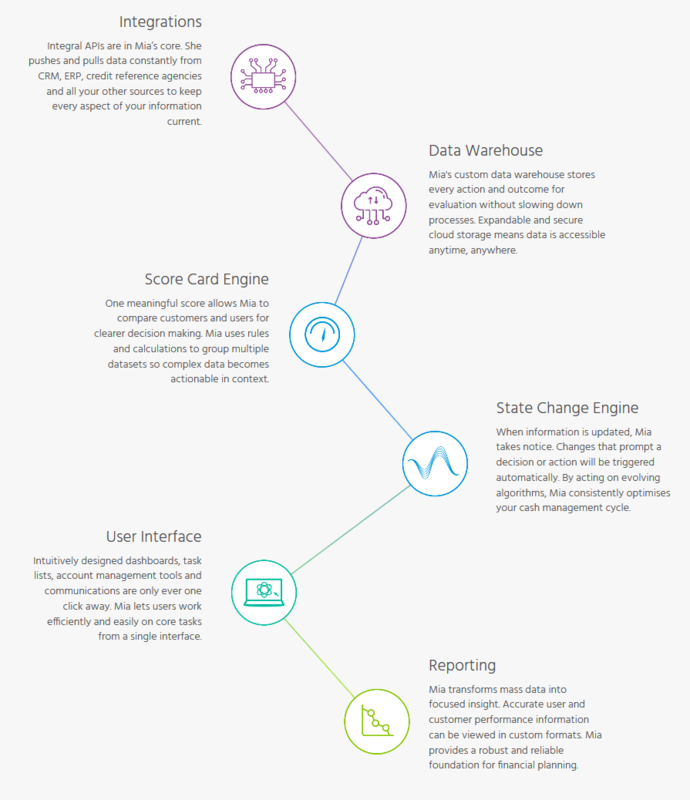 The Mia State Change Engine: The state change engine will trigger tasks or communications 24/7 whenever there is a data change, a user update or a time increment. Configurable Dashboards: Enable users to configure their dashboards using the Mia widget design. Choose which widgets and data is relevant to my user role so that I can quickly access key tasks and information about my customers. Repayment Plan Module: Use the repayment plan module to manage customers that require more time to pay and to ensure that any missed payments are resolved immediately through task assignment. Single Sign On: Make it easy for users to access Mia through their desktop using single sign-on. No longer required to login separately once you have logged in to your desk top. SMS Module: Text customers through the workflow engine or from the desktop. Quick and easy to send a message in a few key strokes. Great for SME sole traders and consumer customers. Email communications: Deliver emails straight from the desktop and attach all of the key data and transactions to help customers to facilitate payment easily. Credit Card: Integrate credit card options into Mia to make it easy for customers to pay online following receipt of a reminder. Post Integration: Integrate with mail fulfilment house by asking Mia to sending all post communications as a file for delivery. Microsoft Power BI Reporting: Mia comes with a data warehouse, so users can use Mia’s service desk to create new reports or use the suite of existing standard reports to gain performance insights. New metrics are constantly being added to help users make data driven decisions. Publish reports using Power BI. Data Modelling: Each new algorithm can be added to the Data Warehouse architecture and used in the Mia score card engine to make data driven decisions. Multi Language Comms Template Pack: Global businesses will want to communicate to customers in their local language. Select the customer language preference and deliver all communications to them in their local language. Language can be targeted per customer contact as well at customer level. Export to csv: Export the transaction grid into csv so that this can be shared with the customer by attaching to an email and importing their responses back into Mia as a mass-update. Line Items: Give users access to invoice line items so that they may manage invoices at a line-item level. If a dispute is on a line then Mia will pass the disputed line item amount to the cash apps team for accurate cash allocation and then manage the disputed line-item through the dispute resolution process. Audit History: Mia stores all user and workflow activities to provide a full audit for reporting analysis. Search: Use quick search to find an account in under a second. Document Integration: Integrate document store into Mia so that users and customers can access documents through a quick API call, so that they may have the information required to approve payment. 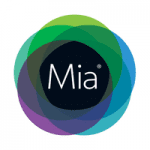 Mia is live and helping clients to transform data into process. Cutting edge technology powers Mia’s incisive ability to build algorithms and deliver actionable business insight. As a platform designed to deliver increased profits, reduced cost to serve, user collaboration and an improved customer experience Mia allows users to make faster, smarter, data driven decisions. Today Ballard Chalmers continues to work with SMT on maintaining and updating the platform with the latest features and Microsoft enterprise technologies to keep giving Mia’s clients the best possible order to cash business process and intelligence enterprise application on the market today.